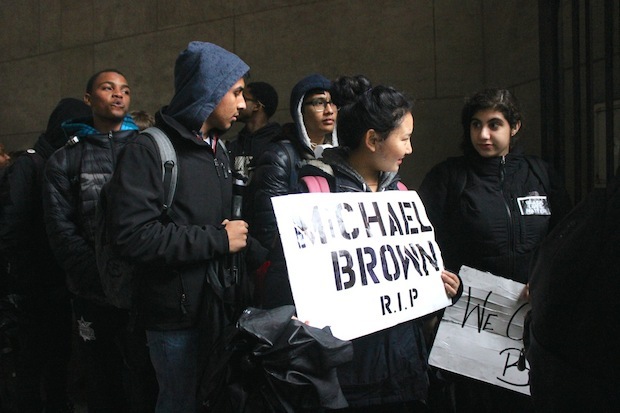 EAST VILLAGE — Braving the wind and rain, dozens of East Village students walked out of school Tuesday afternoon and went forward with an officially canceled march to protest a grand jury’s decision not to indict an NYPD officer in the chokehold death of Eric Garner. East Side Community High School, which teaches grades 6 to 12, had planned a supervised march during the school day as a way to help students express their feelings about recent events and to teach them about positive civic participation, Principal Mark Federman said. “Our students have been very engaged and very interested and talking about wanting to take action and express themselves,” he said. But the Department of Education canceled the march Monday afternoon, due to concerns about safety, educational value and bias, Federman said. “We support school communities that look to engage students with organized, productive activities outside of school hours, provided they ensure the safety and security of everyone participating,” she said in a statement. Federman said the DOE’s cancellation took him by surprise, since principals do not typically ask the department for permission to hold school trips. The plan included traveling together to the Brooklyn Bridge and walking across to deliver petitions to United States Attorney’s Office for the Eastern District of New York, which covers Brooklyn, Staten Island and Queens, he said. The school had also notified parents, sent home permission slips and provided alternate “teach in” activities for those who could not or did not want to participate in the march, he said. Parents, he said, were generally supportive of the event. East Side also worked with police to ensure students’ safety and to give students a positive experience with law enforcement, he said. Despite the march’s official cancellation, about 60 students — some accompanied by their parents — left the school at about 1:30 p.m. Tuesday to move forward with the demonstration. Helene Kierulf said she took her 13-year-old daughter Maya Lam out of class after she expressed an interest in participating in the march. Maya said she was “really disappointed” by the decision to cancel the protest. “They…said it wasn’t educational and they were worried about students getting hurt but I don’t think that was going to be a problem because we’re trying to make a peaceful protest, not a riot,” she said. Led by student organizers dressed in black with bands of orange tape around their arms and legs, the group walked from the East 12th Street school to the Astor Place 6 train. They met up with police officers at the Brooklyn Bridge, who accompanied them as they made their way to the federal prosecutor’s office. Federman said he did not know if students would continue with the demonstration because of the weather and because talk of protesting another day, he said. He had also been focusing on the “teach in” that DOE had allowed to continue, which included activities like writing letters and watching and discussing movies related to issues in the Eric Garner case like “Fruitvale Station,” Federman said. Once students started to leave, however, he notified DOE and began calling parents to let them know that their children had walked out of school. The students followed the plans the school had come up with before the march was canceled, he said, and parents and students updated him on their progress through text messages. “I would’ve intervened if I felt concerned about safety but I still felt confident about their safety and at that point momentum had picked up,” Federman said.